Getting up on a Monday morning can be hard – and when chilly winter mornings are compared to a snug bed, it can feel like an impossible task. If only you could just snooze on and sleep the cold morning away. 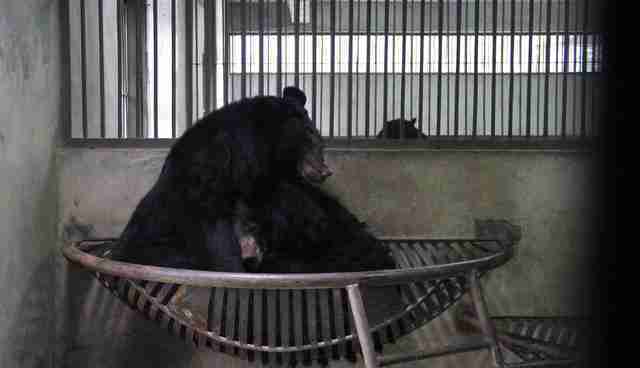 That's exactly how the moon bears at Animals Asia's China Bear Rescue Centre often feel. Only they have the luxury of staying in bed and sleeping the whole morning though whenever the mood takes them – and it often does. Wild moon bears in cooler climates often experience a period of winter dormancy. During this time, the bears eat much less, relying on fat reserves built up during the late summer and autumn and will generally be very inactive. Moon bear pals Chanel and Longo both have a history of enjoying a dormant period during winter, but this year they've realized that there is no better time for a little company. "In previous years these two have nested down in separate baskets but this year they've joined forces. Most mornings the pair stay snuggled up in a basket together." Chanel and Longo's appetites have significantly dropped and they are definitely not getting up for breakfast. They still have access to the enclosure, but the pair are pretty much choosing to stay in bed all day – much to the envy of sanctuary staff! Most days they will get up in the evening for the afternoon feed in the den, but it is slow going and they usually only eat half their food." 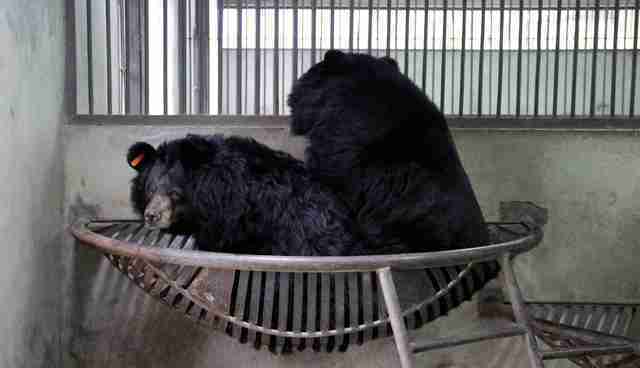 Chanel and Longo are two of over 500 moon bears rescued from the bear bile trade in Vietnam and China by Animals Asia. The animals are kept in tiny cages suffering agonizing extraction of their bile – a liquid produced by the gall bladder and prized in traditional medicine. It's possible for a bear to endure up to 30 years of such torture, but most are underfed, dehydrated and suffer from multiple diseases and malignant tumors that ultimately kill them long before. It's believed that up to 12,000 bears remain on bile farms across China – where the practice is still legal – and Vietnam where it has been illegal since 1992. "I love seeing the bears enjoy their snug winter dormancy days. 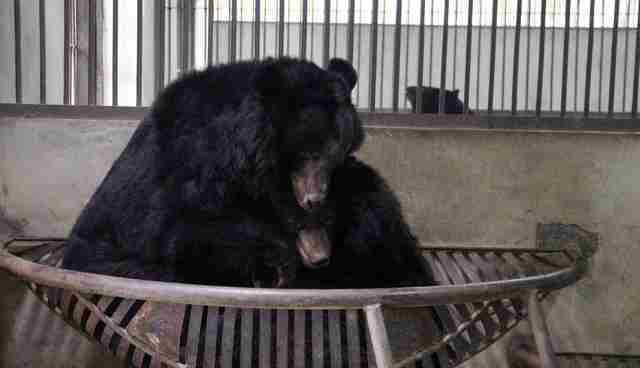 It's such natural behaviour that would have been denied during confinement on bear bile farms. The fact that they are expressing instincts like this at the sanctuary helps us know that we're on the right track in terms of providing them stress free lives – and so nice to see them able to follow their natural instincts at last." Sleep tight and sweet dreams Chanel and Longo!